So several people have asked me since I began the Modern Southern Cook for a muffin recipe that reduces the oil and fat without bananas. Of course. the reasonable substitute is apple sauce. This recipe uses apple sauce both as a substitute for oil as well as a flavoring ingredient. The addition of oats also adds a great texture to the muffin. For an added benefit, while these tender, delicious muffins are in the oven, your house will smell of apple pie, which is never a bad thing! Give these muffins a try; they are absolutely so moist that you would never guess they are a lighter version of something so hearty. 1. Preheat the oven to 350 degrees. Coat the muffin pan with non-stick cooking spray. 4. Slowly stir the wet ingredients into the dry until just combined. The batter will be thick. 7. Bake for 40 minutes or until golden and the spring back to the touch. You can test with a toothpick for doneness if you are not sure. When trying to decide what to make for breakfast this week, I wanted to experiment with a new muffin recipe. 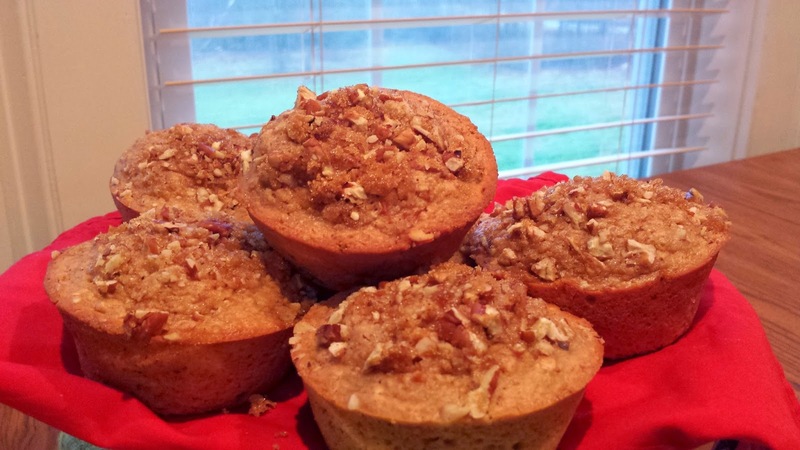 By replacing some of the flour with oats, the fiber content of these muffins is bumped up. Additionally, the oil is replaced by a mashed bananas, adding a little sweetness, creaminess, and additional nutrients. This oatmeal muffin has all of the flavor profile of a traditional banana nut without all the guilt....if you feel guilty about things such as that. More than anything, this recipe gives you an extra muffin recipe to add to your archives. Plus, you will have an easy and portable oatmeal breakfast for those rushed weekday mornings! 1. Place the oats into a food processor fitted with the blade attachment. Process until the oats are the consistency of flour. 2. Place the processed oats, flour, brown sugar, pecans, baking powder, cinnamon, ginger and salt into the bowl of a large mixer. Stir to combine. 3. Add the mashed banana. Mix for 1 minute to combine. Scrape the sides of the bowl. 4. Add the milk, egg, and vanilla to the mixer. Mix the ingredients for 2 minutes, scraping the sides of the bowl to combine. 5. Prepare a large muffin tin by spraying with non-stick cooking spray. 6. Evenly divide the batter between the six muffins. 7. Sprinkle the reserved brown sugar on top of the muffins. 8. Bake in a preheated 350 degree oven for 35-40 minutes until golden brown. 9. Allow the muffins to cool at room temperature for 5 minutes before removing from the pan. A few weeks back, I began experimenting to recreate one of my husband's favorite childhood treats. He loves the classic Southern sandwich cookie known as the "Moon Pie." These cookies have a crisp, almost graham cracker like shortbread cookie layered with marshmallow cream and covered in chocolate. After much research and an afternoon in the kitchen, I had developed a pretty good recipe. This recipe is a modification of the original recipe. In honor of Saint Patrick's Day, I added the green food coloring to the marshmallow cream. The mint flavor makes the sandwich cookies reminiscent of another one of my husband's favorite childhood treats, the Andes mint. If you are willing to be patient and try something new, you will love these cookies. *Note: Read all of the instructions prior to beginning the process. 1. In the bowl of a large mixer fitted with the paddle attachment, cream the margarine/butter until light and fluffy. Add the brown sugar and cream for an additional 3 minutes. 2. Reduce the speed to medium and add the egg and vanilla. Beat to combine. Scrape the sides of the bowl. 3. With the mixer on low, add the flour and salt to the cream mixture, incorporating a little at a time. 4. Divide the dough equally onto two pieces of plastic wrap. Tightly cover and form a small disk. Allow to set in the refrigerator for at least 30 minutes. 5. After chilling, remove one disk of dough from the refrigerator and roll out on a very well floured baking mat. Roll until between 1/4" and 1/8" thickness. Use a 2 inch cookie cutter to cut the cookies from the rolled out dough. Carefully place the cookies onto a cookie sheet lined with a Silpat mat or parchment paper. Leave at least 1" between each cookie. Place any unused dough back in the plastic wrap and return to the refrigerator while the batch bakes. 6. Bake at 350-degrees for 10 minutes. Remove from the oven and allow to cool for 2 minutes before transferring the cookies to a cooling rack. 7. Repeat the process as many times as needed to use all the dough. This will vary depending on the size of cookie sheet you use. 8. Allow the cookies to cool completely. 9. When the cookies are completely cool, begin preparing your marshmallow cream. 10. Place the egg whites, cream of tartar and salt into the bowl of a large mixer fitted with the whisk attachment. Slowly increases the speed of the mixer to incorporate air. Continue to whisk until stiff peaks form. 11. While the egg whites are whisking, heat the corn syrup over high heat in a small saucepan. DO NOT STIR!!! Use a candy thermometer to read the temperature of the syrup. Heat, undisturbed, until it reached 235-degrees. 12. Slowly stream the hot syrup in the the stiff peaked egg whites. Continue to beat for 2 minutes until the mixture is glossy. 13. Reduce the speed to low and add the powdered sugar, extract, and food coloring. 14. Using two spoons, mound 1 Tablespoon of the marshmallow cream onto a cooled cookie. Place another cookie on top of the mound and carefully press. If the cream begins to spread unevenly, simply slowly rotate the top cookie to even distribute the filling. Repeat for all of the cookies. Place the sandwich cookies on a cooling wrack placed over a large cookie sheet. 15. To create the chocolate coating, place the chocolate chips and oil in a large heat proof measuring cup or bowl. Heat in 30 second bursts in the microwave, stirring between each heating. Repeat until all of the chocolate is melted. It should take 3-4 bursts. 16. Carefully spoon the melted chocolate over the sandwich cookies, using the back of the spoon to carefully drip the coating over the sides. 17. Refrigerate the sandwiches for at least 1 hour to allow the chocolate to harden and the marshmallow to set. 18. Store cookies in an airtight container in the refrigerator.